Note: Since writing this post we've learned a lot more about the IVE's troubled history. We encourage you to get the full story on hour History page here. 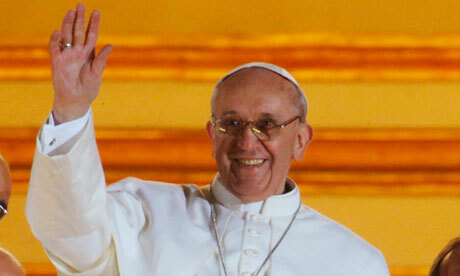 We can't be sure of the Institute's reaction to an Argentine Cardinal being selected as Pope. We imagine they are putting a good face on the situation - ie. "Yay Argentina!" - but in reality this was probably not good for the Institute. His selection has spawned a new round of research and the information we've come across is, um, very interesting. According to Argentine news reports here and here, Cardinal Bergoglio, now Pope Francis, was the Primate of Argentina during the first investigation into the IVE. You can read the articles yourselves (use Google's Chrome browser to translate them automatically), but we'll summarize and give our take below. After reading these articles it is becoming clear that the Argentine Bishops, led by Cardinal Bergoglio - now Pope Francis - shut down the IVE (probably for the same reasons we decided to start this site.) They stopped the ordinations, shut down the seminary, and put restrictions on the founder Fr. Buela and the other IVE priests. So when the Institute of the Incarnate Word tries to blame their Argentine problems on "liberals" and "left-wingers", it's the Pope they are blaming. What is also news to us is that Cardinal Sodano - the same Cardinal Sodano that got busted taking bribes from and supporting the Legion of Christ's disgraced founder Fr. Maciel - is the person that helped Buela and the Institute get out of their problems with the Argentine Bishops. In efforts which would not have been outside of (former Argentine President) Menem's former ambassador to the Vatican and current gentleman of the Holy See, and Archbishop Aguer Esteban Caselli, Buela got the powerful Cardinal Angelo Sodano to protect him. Not only did the Vatican reverse the order closing its seminaries, but it managed moving the IVE headquarters to Italy, to the diocese of Velletri-Segni, 60 kilometers south of Rome, where since mid-2001 has its Generalate and Buela parent lives. In the words of the IVE, Sodano is "so close to our Institute." The Italian Bishop where they are based even clarifies that he made the decision to let the IVE in "with the continued support of His Eminence Cardinal Sodano..." Sodano even helped them get the Novitiate opened in Chile. These moves by Sodano were a "great humiliation" and a "slap in the face" to the Argentine Bishops. So much so that then Cardinal Bergoglio even traveled to Rome to meet privately with Pope Benedict and express his concern over influence that Ambassador Casselli (and his ally Sodano) still had in appointing Bishops (such as the lone Argentine supporter of the IVE, Bishop Hector Aguer.) Like an excerpt from a Godfather movie, Casselli, Aguer, and Sodano coordinated together and the Sodano and Casselli families even had close economic ties. As the saying goes, "Judge them by the company they keep." If you judge the Institute of the Incarnate Word by the Cardinals that help them out, Cardinal McCarrick and Cardinal Sodano, it doesn't paint a pretty picture. TO SUM IT UP: Then Archbishop Bergoglio, now Pope Francis, tried to shut the IVE down 15 years ago. Cardinal Sodano - the same guy that shielded the pervert Maciel in exchange for bribes - went over the Archbishop's head to keep the IVE seminary in Argentina open, find them a new diocese, and even help them open their novitiate in Chile. Don't take our word for it. Go to http://www.google.com.ar/ and search for "Bergoglio Instituto Verbo Encarnado" (or "Bergoglio Sodano" or "Sodano Buela" or "Sodano Instituto Verbo Encarnado") for much, much more on this and don't forget to use Google Chrome to translate for you automatically. There is much more on this we will publish as time permits.